Poplar Forest was designed by Jefferson to be a retreat home for those times that he wanted to escape the hustle and bustle of Monticello. To spend quiet times away with the grandchildren he doted upon, to read, to write and to think. He spent a great deal of time here after his retirement from government at the age of 65. 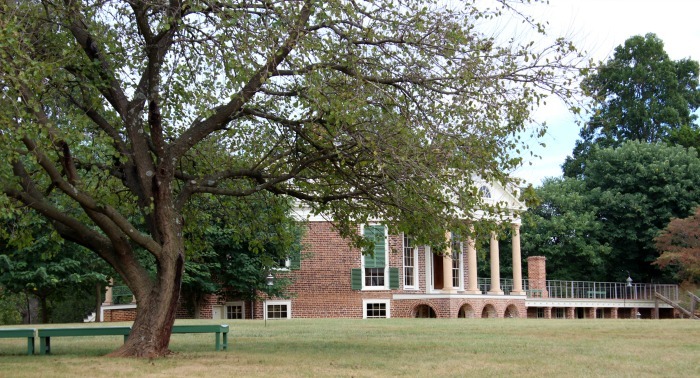 I’m completely intrigued by Thomas Jefferson, so when I discovered that he had this second home and I hadn’t seen it, it became another bucket list moment! So as my husband and I were driving through Virginia this summer on our way to North Carolina we planned an extra day so we could take in his home. Poplar Forest sits atop a beautiful hill as does Monticello. As you drive up the road and look upon the home you immediately notice the similarities in design. Unmistakably Jeffersonian! The home is in the process of being renovated to return it to exactly as it was in Jefferson’s time. Hence a great deal of archaeology and research is ongoing to uncover new knowledge of the home and gardens, etc. 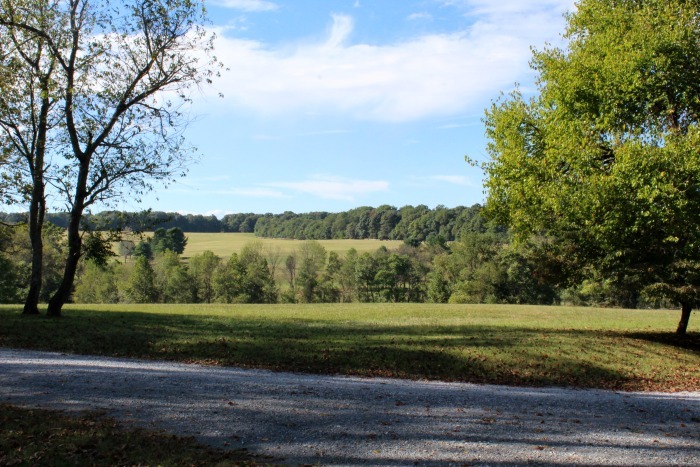 The view from the front porch and lawn of the home is of beautiful rolling tree covered hills and pastures. Lovely view of the side of the home. View of the back of Poplar Forest. The back of the home from another angle. The attached building stretching out to the side contained the kitchen, laundry area and offices. Can you guess what this is? 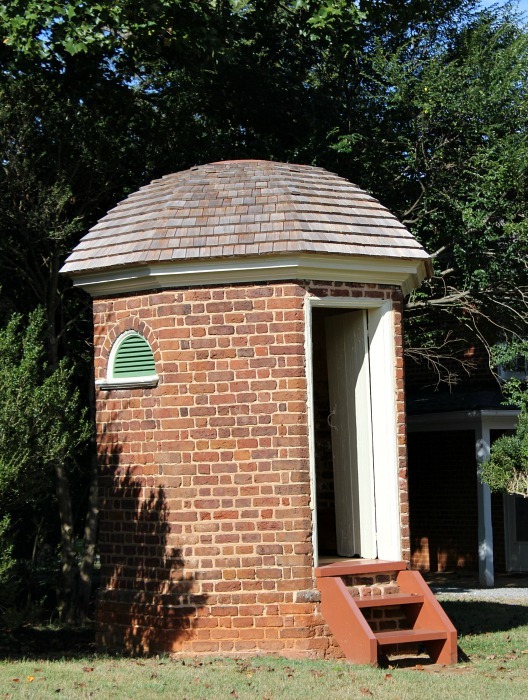 One of two identical outhouses, one on each side of the main house. They were very nice for the day! Thomas Jefferson is recognized as one of our great architectural masters. Consequently, Poplar Forest is one of those masterpieces. Visiting this home and his Monticello will give you new insight into this man that gave 40 years of his life to the service of our nation at a time when it needed him most. 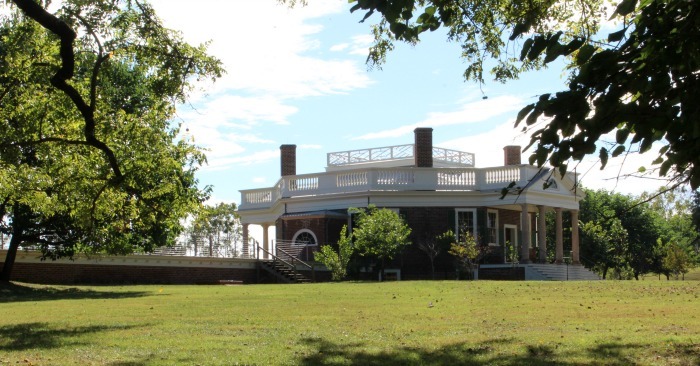 You can read more about Poplar Forest and Monticello at their websites. To learn more about our founding fathers, plan a trip to visit these homes along with the homes of James Madison and James Monroe. All located in the heart of central Virginia! Thank you wonderful readers for stopping by! P.S. Wonder why there aren’t any pictures of the inside of this home? Photography is usually prohibited inside historic homes for preservation reasons. Exposure to photography lights and flashes has a detrimental effect on textiles, paper, etc. It causes fading and deterioration. However, you can apply for special permits to be able to take photographs. This post will be shared on many of the very special link parties found on my “Where I Party” page. 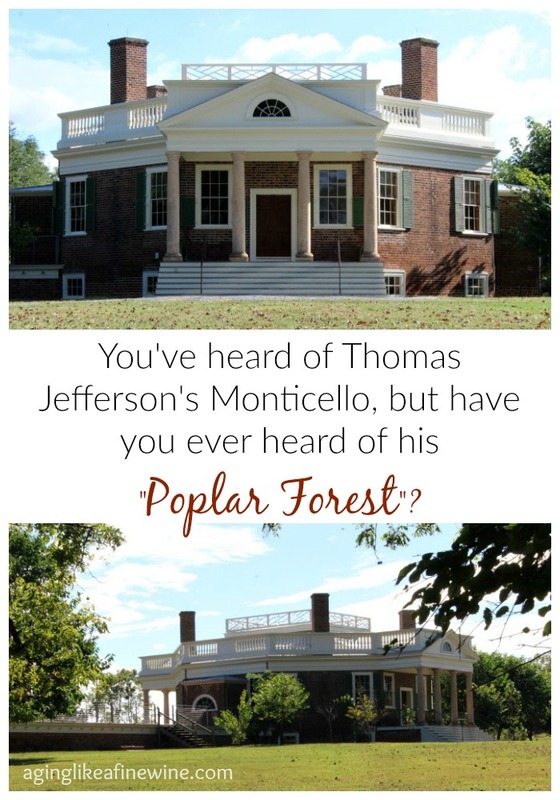 Never knew about Poplar Forest. It’s within a weekend-away drive for us. Will add it to my trip list. Also ginning up by interest in Jefferson–I’m three quarters of the way through Hamilton (the Chernow book) and it makes me want to know more about his philosophical opposite. thanks for the trip tip. Oh isn’t this beautiful. I think it would look very good sitting on our land. I did not know about this home. I’m sure it would! Thomas Jefferson’s designs were, and still are, so unique. I love learning about our nation’s founding fathers. I love these photos. I definitely want to go there. Thanks for sharing. There is so much wonderful history of the early days of our country. Most of it I will never get to see. Thank you for sharing some of it. I am a history teacher but not U.S., world. However, I’m interested in Jefferson. I find him very interesting and love reading about him and visiting his homes. His inventions, including the design of his homes, were very advanced for their time. Thank you for stopping by and reading!